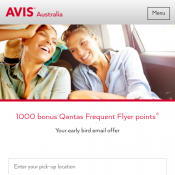 Earn a bonus 1,000 Qantas Frequent Flyer Points on your next booking. Simply rent any car (group D or above) for 4 days or more with Avis in Australia before 30 September 2018. Blackout period applies. Include coupon number: MPPA029 in your booking. Blackout date applies 22 September 2018 – 13 October 2018. Minimum rental period of 4 consecutive days apply. Avis standard age, credit and driver requirements apply. Subject to the terms and conditions of the Avis Rental Agreement at the time of rental.